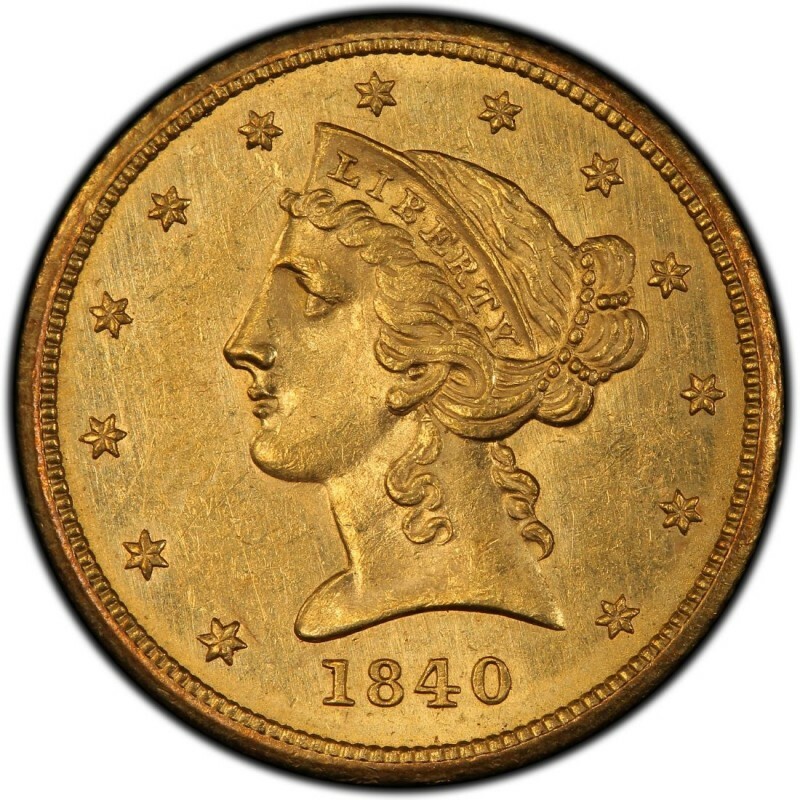 1840 Liberty Head half eagles represent the second year of the long-running $5 gold coin series that was designed Christian Gobrecht in 1839. Gobrecht was also the same individual who designed the Seated Liberty coinage that was produced from the 1830s through 1890s. Liberty Head $5 half eagles feature 90 percent gold, 10 percent copper composition that has a total net pure gold weight of 0.24187 ounces. In all, $5 Liberty Head half eagles weigh 8.359 grams. 1840 was a year during which the diameter of the denomination was changed. During the first two years of the series (1839 and 1840), Liberty Head half eagles measures 22.5 millimeters in diameter. By the end of the year 1840, the diameter of the coin was reduced to 21.6 millimeters, making it slightly larger than a modern-day 5-cent nickel. 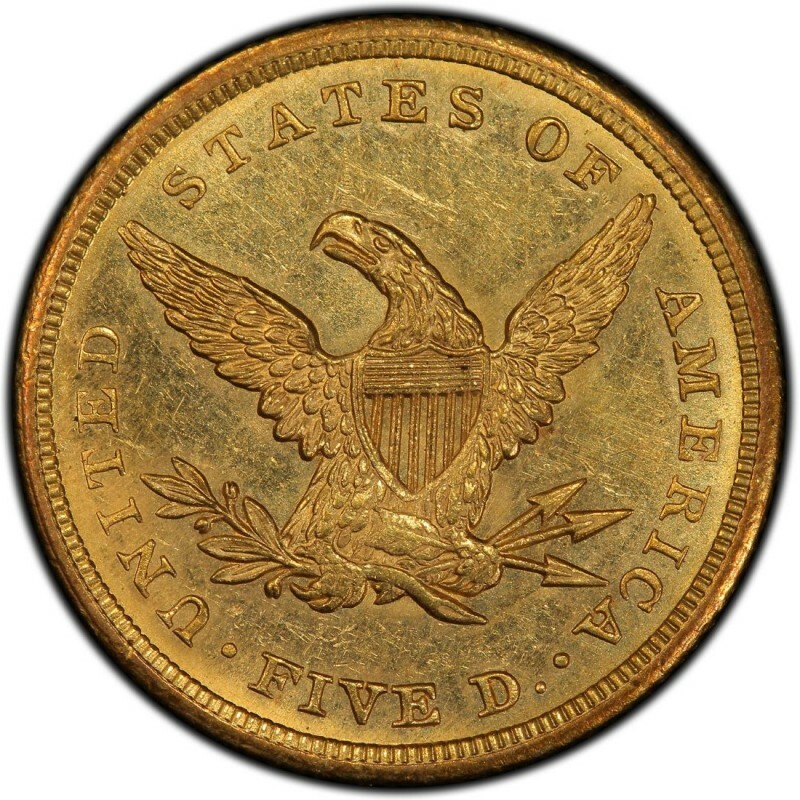 Some varieties of the 1840 (Philadelphia) and 1840-O (New Orleans) Liberty Head half eagles exhibit finer edge reeding and wider rims of the 1839 $5 gold coins. Referred to as “broad mill” pieces, these Liberty Head $5 gold coins are scarcer than the regular issues and command higher premiums. 1840-C $5 Liberty Head Half Eagle Gold Coin PCGS AU50 RARE!